An abysmal first nine games of the seasons has been characterised by problems for Sunderland all over the pitch, and those troubles begin with the first name on the team sheet. Having failed to keep a single clean sheet in the Championship so far, Simon Grayson needs a goalkeeper that can be relied upon to provide the foundations needed to start a recovery. But should it be Justin Steele or Robbin Ruiter between the sticks? Filling the gloves vacated by Jordan Pickford was never going to be easy, especially after Vito Mannone departed, too, for Reading. However, both goalkeepers would have expected more from their opening matches at the Stadium of Light. Jason Steele joined the club from Blackburn for a fee of around £500,000 and certainly boasts bags of experience at this level. However, the 27-year-old has failed to deliver on some of the heights predicted around the time of his stint as the England Under 21 goalkeeper. While the goalkeeper cannot be blamed for the forecasts of others, there’s no doubt that his stock has dropped massively – not least following relegation from the Championship in his final year at Ewood Park. Many Sunderland fans would argue that reduced confidence was apparent in both pre-season and Steele’s spell between the posts during the early weeks of the campaign. Things probably weren’t made any easier by the fact that his place in the team was due primarily to his teammate’s late registration just prior to the big kick-off. Ruiter hasn’t been perfect by any means since taking over, though. Nevertheless, the Dutchman has been one of the better players in the team and, as confirmed by Sunderlandecho.com, could not be blamed for the weekend defeat at home to Cardiff. The shot-stopping abilities are something we picked up on in pre-season prior to the his commitment to the club, but there are still questions to be answered by the 30-year-old. 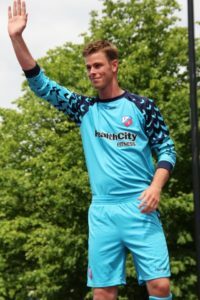 Furthermore, according to Dutch site Onlinewedden.com, Sunderland fans can hope to see the goalkeeper grow as the season develops. While he may have lost his regular place in his final year at Utrecht, largely to missing large parts of the campaign with a broken collarbone, the former Volendam certainly improved in stature during his five-year stay. Once settled in England, those qualities should start to show. The free signing will know that the pressure is on from Steele too. The Englishman made a couple of poor mistakes during his first four appearances, but has shown good shot-stopping abilities, too. Right now, Grayson is likely to stick with his Dutch goalkeeper while Steele is condemned to waiting patiently on the bench. In reality, very few Sunderland fans would disagree with it. If the defence could just help out too, Ruiter could become a key figure as the club aims to drag itself away from the bottom three. Both are not really up to the standard we are used to,but Ruiter is the best of the two.When you look back we never had trouble between the sticks…Pickford,Montgomery,Mammone,Turner,Siddle,Norman,Given are a few of the good un’s! Can either of them play upfront? Beg to differ but Steele for me all day, he knows how to catch the bloody ball, not punch it. BREAKING NEWS – SG would appear to agree with me. Pass me a huge slice of that humble pie. They’re both way below expected standards. I think if we had both in goal at the same time, with twelve players starting, we still wouldn’t keep that many clean sheets. Jason Steele seems like a combination of two television investigators. One from the early seventies and another from the eighties. The dandy Jason King and the (randy?) Remington Steele.